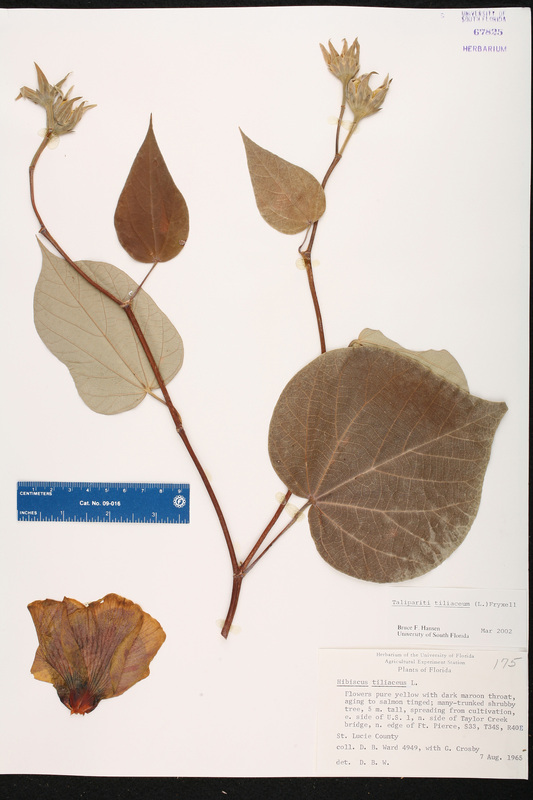 Citation TALIPARITI TILIACEUM (Linnaeus) Fryxell, Contr. Univ. Michigan Herb. 23: 258. 2001. 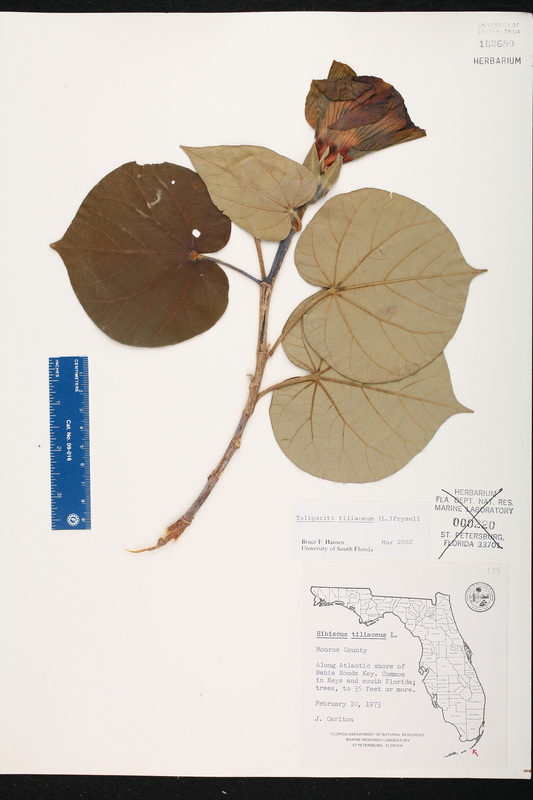 Basionym: Hibiscus tiliaceus Linnaeus 1753. Type: SRI LANKA: Without data, Herb. Hermann 3: 51, no. 259 (lectotype: BM). Lectotypified by Borssum Waalkes, Blumea 14: 31. 1966. 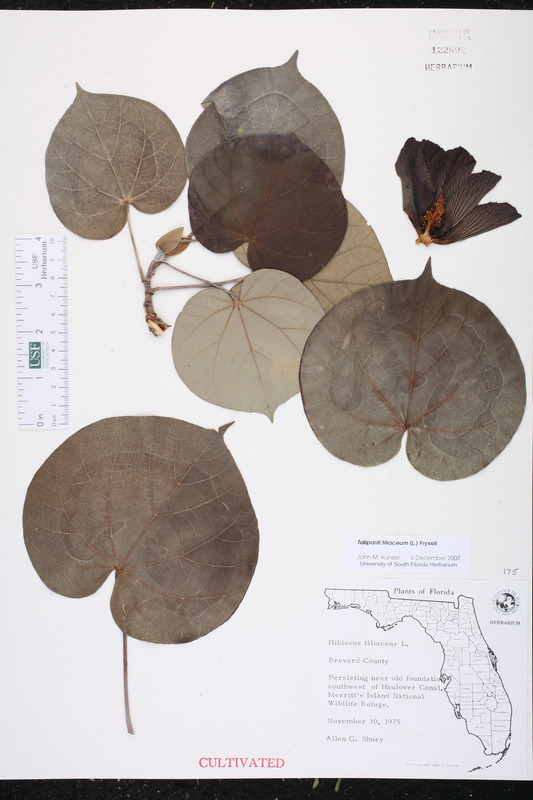 Hibiscus abutiloides Hibiscus abutiloides Willdenow, Enum. Pl. 736. 1809. Hibiscus tiliaceus Hibiscus tiliaceus Linnaeus, Sp. Pl. 694. 1753. TYPE: SRI LANKA: Without data, Herb. Hermann 3: 51, no. 259 (lectotype: BM). Lectotypified by Borssum Waalkes, Blumea 14: 31. 1966. Hibiscus tiliaceus var. 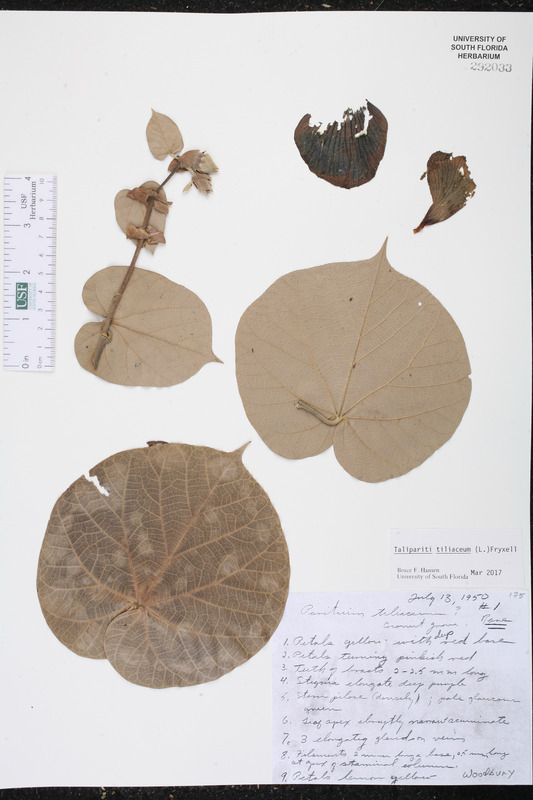 abutiloides Hibiscus tiliaceus Linnaeus, var. abutiloides (Willdenow) Hochreutiner, Nova Guinea 14: 163. 1914. 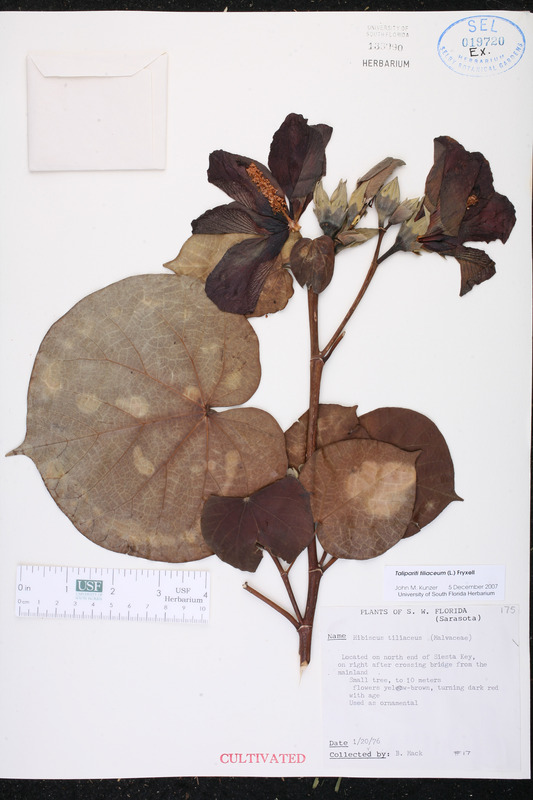 BASIONYM: Hibiscus abutiloides Willdenow 1809. Hibiscus tiliaceus var. 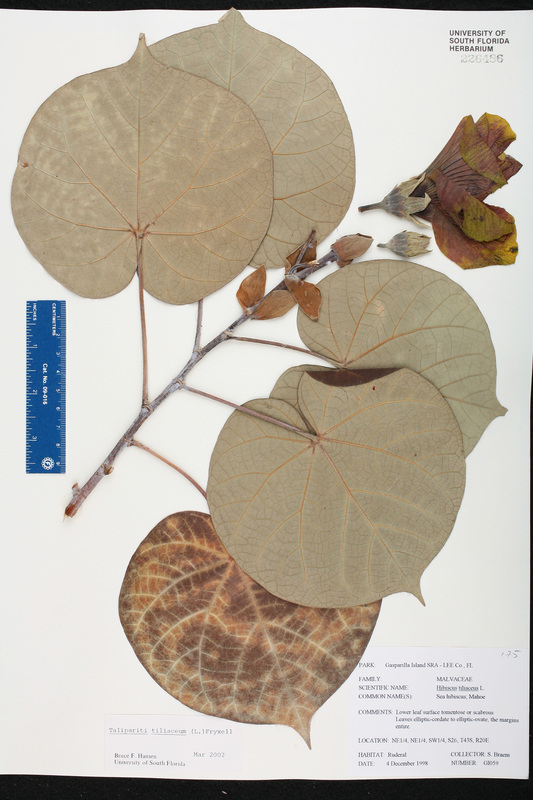 genuinus Hibiscus tiliaceus Linnaeus, var. genuinus Hochreutiner, Annuaire, Conserv. Jard. Bot. Genève 4: 63. 1900, nom. inadmiss. 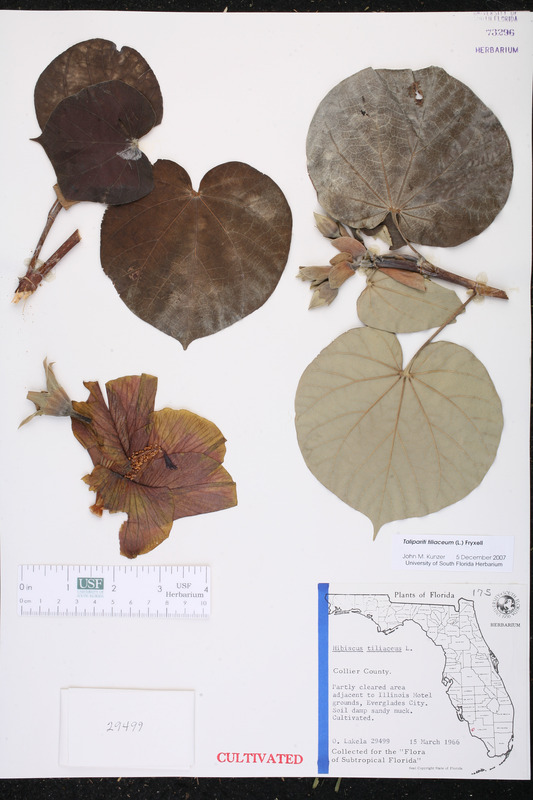 BASIONYM: Hibiscus tiliaceus Linnaeus 1753. 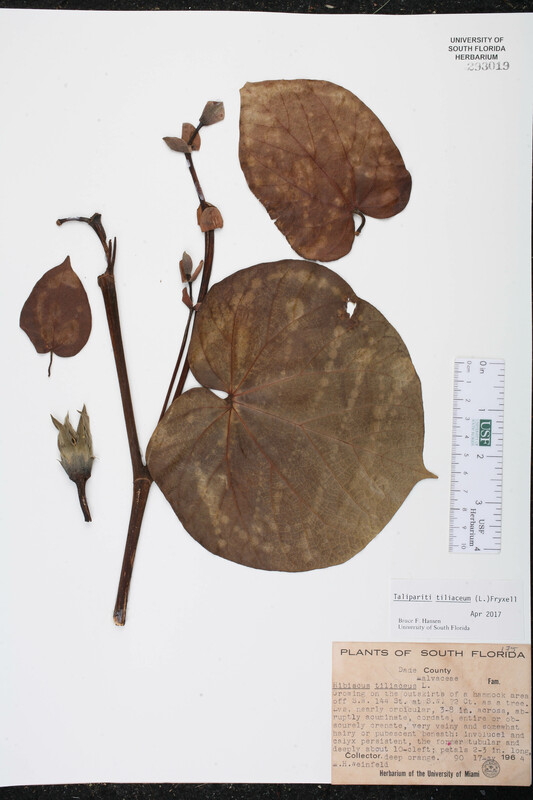 Hibiscus tiliifolius Hibiscus tiliifolius Salisbury, Prodr. Stirp. Chap. Allerton 383. 1796, nom. illegit. 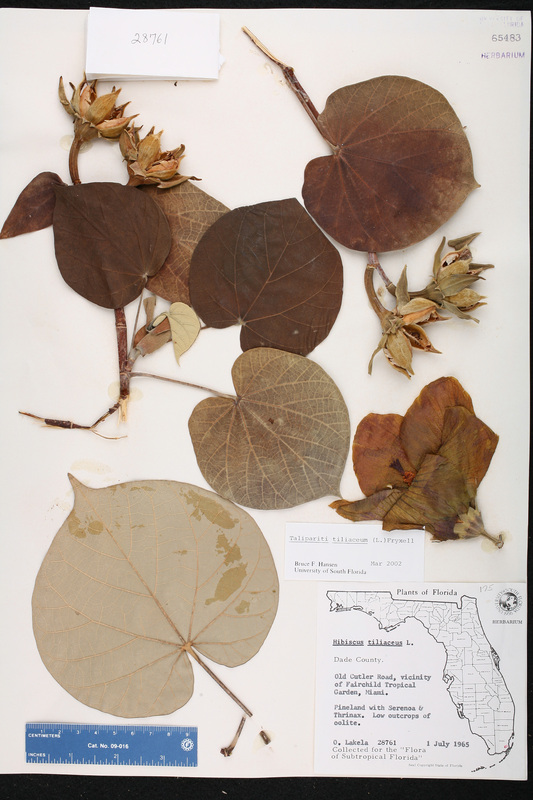 BASIONYM: Hibiscus tiliaceus Linnaeus 1753. 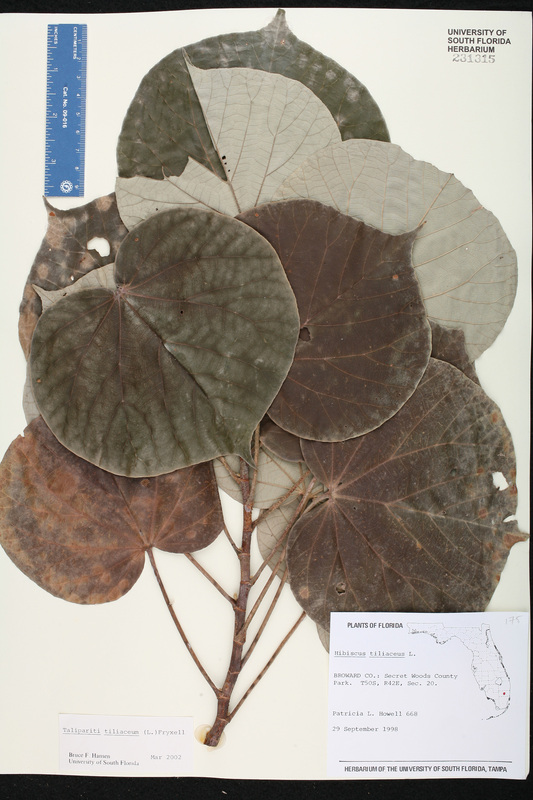 Pariti abutiloides Pariti abutiloides (Willdenow) G. Don, Gen. Hist. 1: 485. 1831. 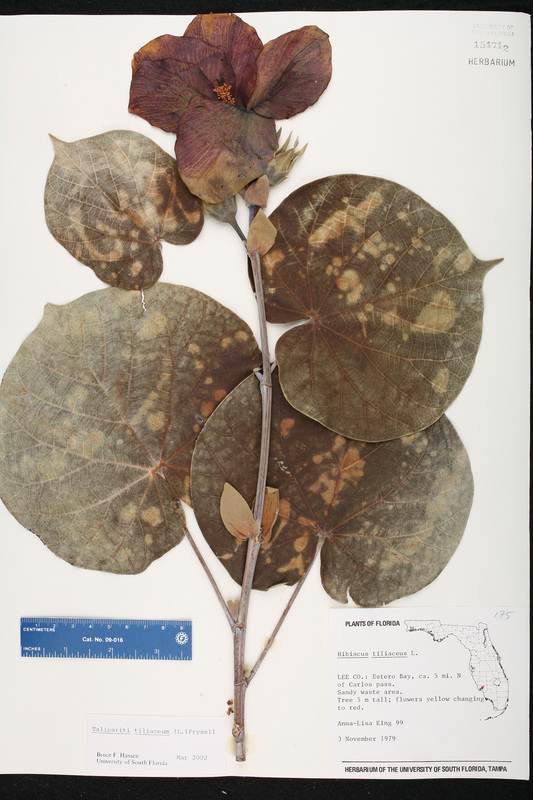 BASIONYM: Hibiscus abutiloides Willdenow 1809. Pariti elatum var. abutiloides Pariti elatum (Swartz) G. Don, var. 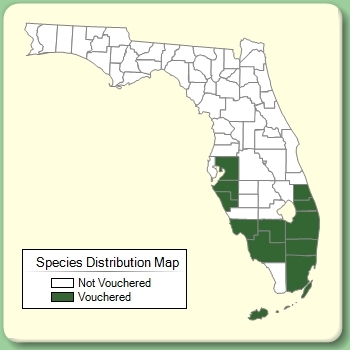 abutiloides (Willdenow) Grisebach, Fl. Brit. W.I. 87. 1859. 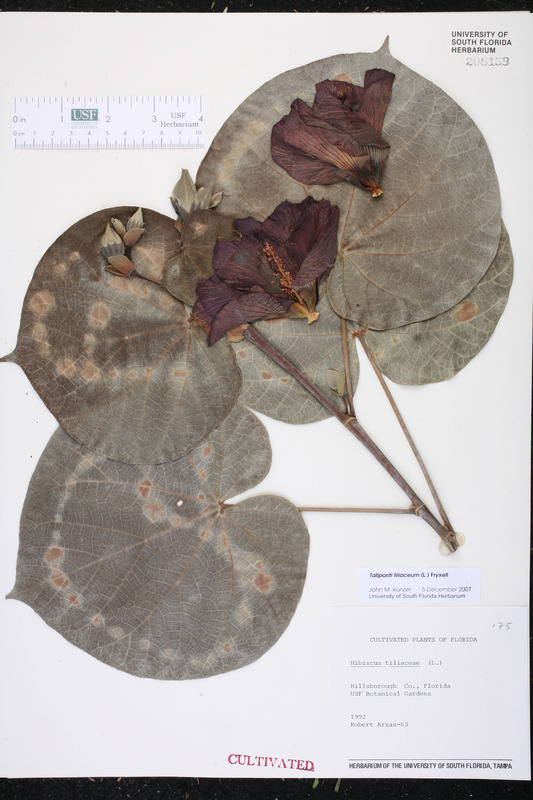 BASIONYM: Hibiscus abutiloides Willdenow 1809. Pariti tiliaceum Pariti tiliaceum (Linnaeus) A. Jussieu, in A. Saint-Hilaire, Fl. Bras. Merid. 1: 256. 1827. 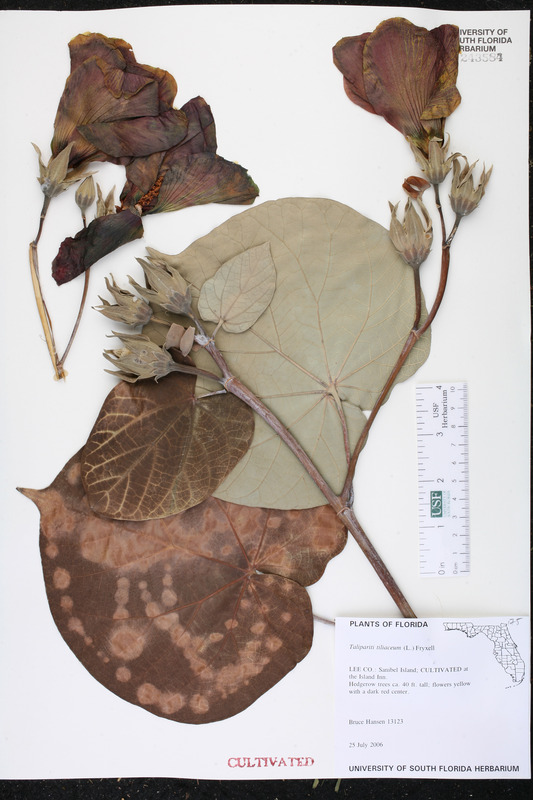 BASIONYM: Hibiscus tiliaceus Linnaeus 1753. Hibiscus circinnatus Hibiscus circinnatus Willdenow, Enum. Pl. 735. 1809. TYPE: Cult. in Austria, 1804, without collector (holotype: B-W). Hibiscus porophyllus Hibiscus porophyllus Vellozo, Fl. Flumin. 280. 1829 ("1825"). TYPE: BRAZIL: Rio de Janeiro: Without data (lectotype: Vellozo, Fl. Flumin., Icon. 7: pl. 28. 1831 ("1827"). Lectotypified by Fryxell, Contr. Univ. Michigan Herb. 23: 260. 2001. Hibiscus tortuosus Hibiscus tortuosus Roxburgh, Hort. Bengal. 51. 1814. 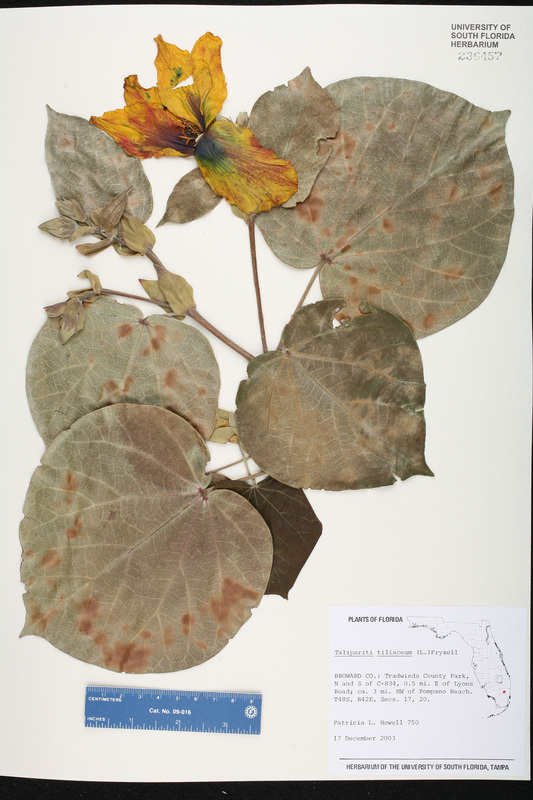 TYPE: INDIA: Kerala: Malabar, without data (lectotype: Rheede, Hort. Malab. 1: t. 30. 1678). 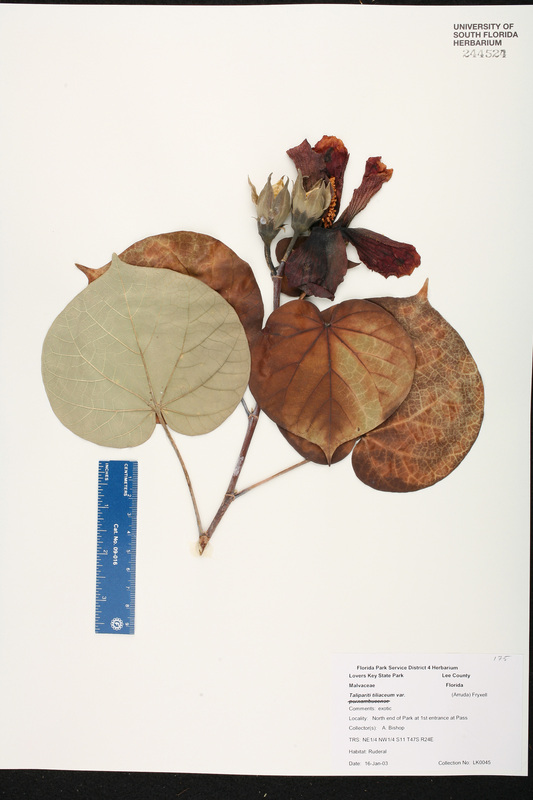 Lectotypified by I. M. Turner, Taxon 62: 157. 2013. Pariti circinnatum Pariti circinnatum (Willdenow) G. Don, Gen. Hist. 1: 485. 1831. 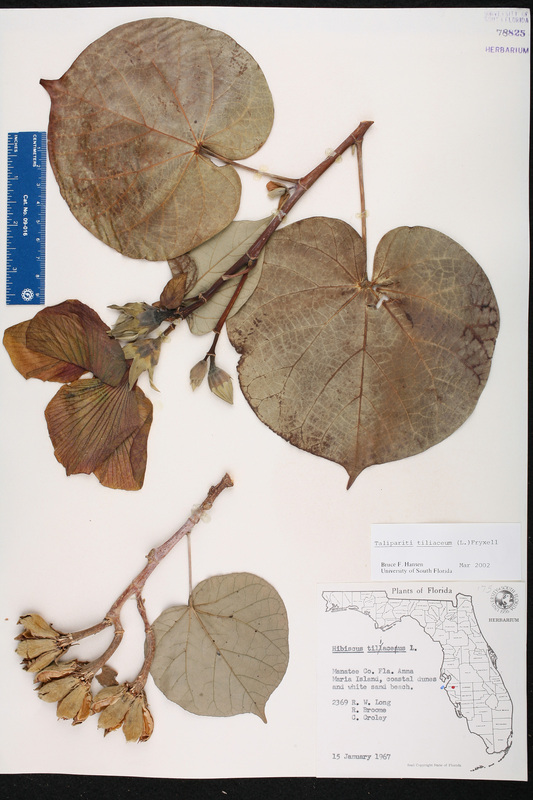 BASIONYM: Hibiscus circinnatus Willdenow 1809. 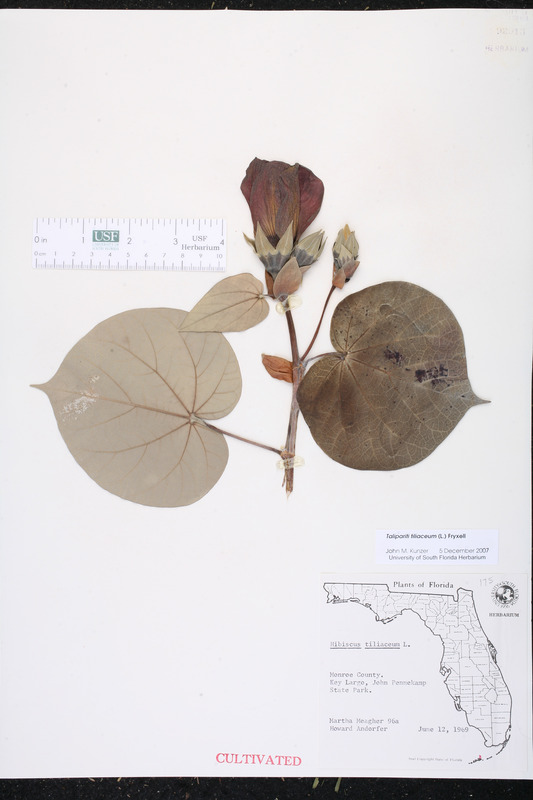 Pariti tiliaceum forma albiflorum Pariti tiliaceum (Linnaeus) A. Jussieu, forma albiflorum O. Degener & Greenwell, in O. Degener, Fl. Hawaii., Fam. 221. 1956. 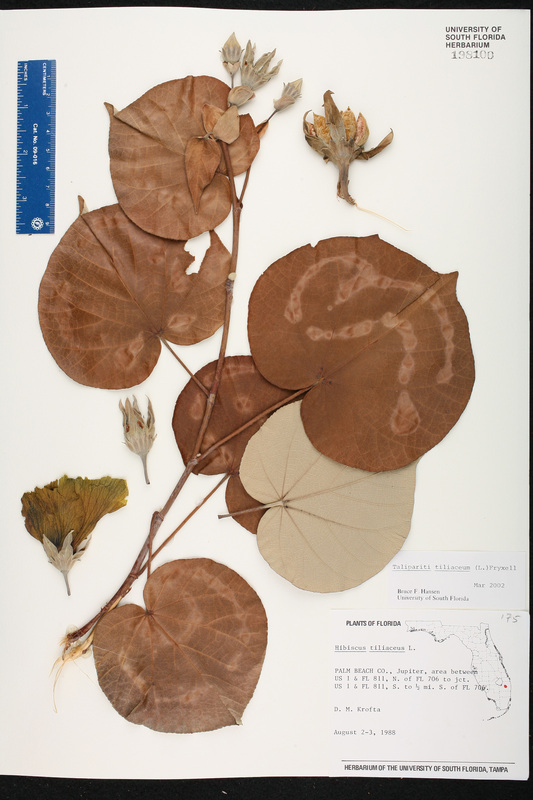 TYPE: TAHITI: Paparas Distr., cult. in Hawaii, 24 May 1933, Wilder s.n. 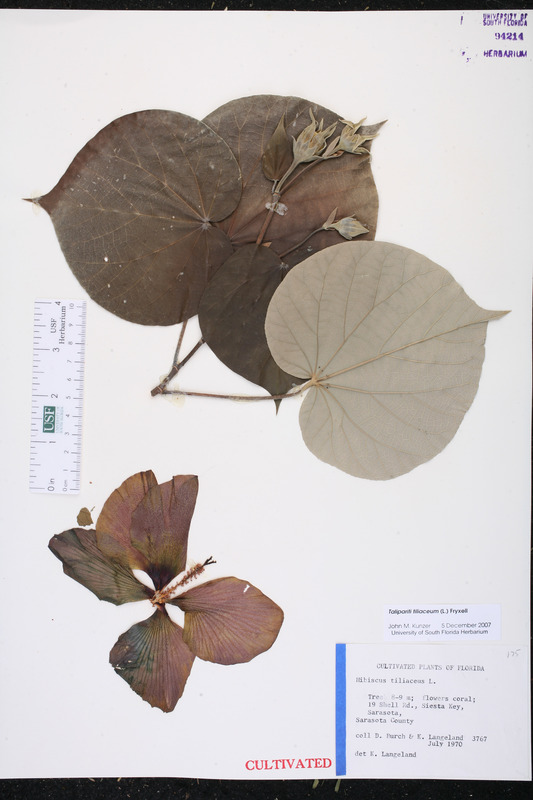 (holotype: BISH). USA Florida Lee Co. 25 Jul 2006 B. F. Hansen 13123 CULTIVATED. USA Florida Sarasota Co. 20 Jan 1976 B. Mack 17 CULTIVATED. USA Florida Collier Co. 15 Mar 1966 O. K. Lakela 29499 CULTIVATED. USA Florida Miami-Dade Co. Jul 1970 D. Burch 3972 CULTIVATED. USA Florida Brevard Co. 30 Nov 1975 A.G. Shuey s.n. CULTIVATED. USA Florida Monroe Co. 12 Jun 1969 M. Meagher 96a CULTIVATED. USA Florida Hillsborough Co. 1992 R. Arias 63 CULTIVATED. USA Florida Sarasota Co. Jul 1970 D. Burch 3767 CULTIVATED.